Our transfer day to mainland China started off as have the others...cleaning up the apartment, doing some final packing, and gathering our whits for the journey...confirming tickets, looking at time tables, making plans. It was a five minute cab ride to the Hung Hom train station in Kowloon. Once there we settled in for a short wait, redeemed our Metro cards and got a nice refund, and then changed HK$ into Chines Yuan (this was a very smart move). We booked VIP first class tickets for the two hour train ride and for $40 each it was worth the expense. 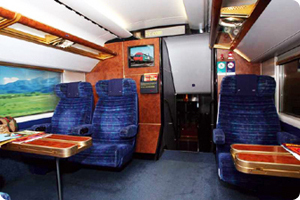 We enjoyed comfortable seats with large windows on an upper level car. The views of the mountains of Hong Kong and then into the plains of Canton were lovely. We arrived in Guangzhou (Canton) mid afternoon and quite efficiently got through immigration and customs with no snags. In the exit hallway we purchased a SIM card for our phone - $60 for 100 calls and 30 GB of data...a good value by local standards...and then consulted with an agent to arrange for a taxi. To our dismay we were informed that our booked hotel was 45 minutes south of the city center. Ugh...how did that happen...did I finally screw up royally and book us in no-man's land? As it turned out the reason I booked this location over a year ago was because it is across from the South Railway station we will be using in five days. We have an early train and it made sense at the time. I simply didn't do a great job of researching the distance from the hotel to the tourist sites we would want to visit. Oh well, the metro will get us back and forth. The hired driver was courteous and whisked us away and out of the city. He had a nice, clean, newer model car and for $40 dropped us at our hotel an hour later. It took us a bit of wandering the apartment complex to find the "hotel" office. It turns out that our choice was not a hotel per se but an apartment complex where owners rent out their units on a day to day basis...sort of like Airbnb...but not as efficient. The desk clerk was courteous but spoke no English...so with the use of his and my translators...we discovered that they had no reservation for us through Hotels.com, that we would have to cancel our existing booking and pay cash for our stay. Not having enough cash for five nights, he drove me to the nearest ATM which was unsuccessful...small local bank not accepting foreign ATM cards. In the end we had enough cash...thankfully we exchanged money before we left Hong Kong...and were able to pay for one night. The next morning we figured it all out using a different credit card and walking to the train station where we found an assortment of ATMs with success. Our apartment is lovely by normal standards...a split level loft with two king beds...although both are hard as rocks...again...what is it with Asian people and their affinity for hard mattresses...I mean REALLY HARD mattresses!!! We have no equipped kitchen this time around, no fridge, and no microwave..and it is just as well...the food here is cheap by our standards...our evening meals was four dishes, more than enough for three or four people...we will order less next time...and cost a whopping $8 USD. With a daily food budget of $25 we will be well within our margins. We are in Canton for four full days, it is raining, and we plan to visit the city center once or twice. The VPN is working well and we can get Facebook, Netflix and Xfinity so we have plenty to occupy our time...and there is another painting forming in my imagination...so all is well. Bobbie downloaded several books before we left Hong Kong...we are set once again in our new home for a few days.